I am considering upgrading my laptop. That led to me evaluate the software I have on my current laptop and decide that of what I have installed, what I really use, what I really need and what I can get rid of. Besides social media and email, the only thing I use my personal computer(s) for is family research. Therefore, I am only concentrating on what I need to support my family research. Now, if I back up a little…I have upgraded hardware several times in the last however many years. In the past I copied all the files from my old computer to floppy drives (yikes), CDs, DVDs, flash drives and external hard drives. Then when I got my new computer I would copy it all on to the new computer. Unfortunately, a lot of that stuff I never really organized on my new computer. It just sat there in a folder called “old computer” until the next hardware upgrade. So, copies became copies. Some files got renamed, some didn’t…WHAT A MESS!!! So this time I’ve decided to organize and do a software audit BEFORE upgrading any computer. I estimate that this will take me…20 years. Kidding. Kind of. Over the next few days I am going to talk about what I have found and where I think I am going. Author Aunt Barb's PapersPosted on May 5, 2014 Categories UncategorizedTags UncategorizedLeave a comment on What did I get myself into?? I was out of town for the weekend on an annual Easter weekend golf trip with friends. Good weather, great company and lots of laughs. When I got home on Sunday I was ready to relax, maybe catch up on a little TV, basically do NOTHING. I got out my iPad and decided to catch up on my genealogy news. That is when my entire Sunday, and pretty much any spare minute since changed. But the database and images not available on ancestry.com is a GOLD MINE!!! Although it only covers 18 years, I have found lost infants, married daughters, lots of mother’s maiden names and I have been able to piece together some families that I was previously unsure of their connections. I have filled in a bunch of those death dates that were previously listed as “between 1900-1910” and “between 1910-1920″from census records. Of course, now I can’t wait for the collection to be expanded so i can fill in even more gaps! Well, it’s been a couple weeks since I got my DNA results. I have shared the results with a few of my relatives and the reaction from my paternal side is a lot of head scratching. It seems the long line of German ancestors isn’t as long as we thought. Looking at my paternal grandmother’s great-grandparents, all 8 of them were born in Germany. On my paternal grandfather’s side, all 8 of that generation were born in Pennsylvania, but going back further, the majority of that line came from Germany as well. Therefore I would except to see larger than a 3% result in the Europe West region. My maternal side is much more diverse, including English, Italian, German and Irish. I still have found no Scandinavian in my research, on either side. I’ve decided I would like to try to separate out the lines so I have asked my mother to take a test and since my father has passed away I have asked his brother to do a test. They have both agreed so in a few months I hope to have a little clearer picture. I just received my AncestryDNA results (faster than the 6-8 weeks they state) and for the most part there were no surprises. To be honest, I was a little disappointed that my results were so “vanilla”. As far as my research, the furthest I’ve gotten back is to about the mid 1600s on one of my branches. My “foreign” ancestors were all here by the 1850s, my 2nd great-grandfather Massimo Pisani was the last to come to the U.S. in 1856. Once my ancestors were here they didn’t move around much. Except for one branch that moved from Boston, MA to Baltimore, MD in the 1820s, all my ancestors lived their entire lives within 15 miles of where they were born. I expected to see more German as my father’s side is very heavily German. But after looking at the mapped results and reading more about migration patterns, the 39% Scandinavian and 9% Europe (East and West) makes sense. 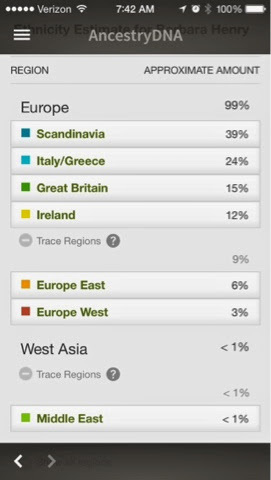 I have never encountered any Scandinavian roots in any of my ancestors but DNA goes way further back than my research. Hopefully I’ll be able to meet some new cousins who may have better answers, but for now I need to go buy myself a helmet and learn how to row a boat! Author Aunt Barb's PapersPosted on April 8, 2014 Categories UncategorizedTags UncategorizedLeave a comment on I’m a…Viking?